He Spent How Much On A Jersey? John and the boys traveled to the Bay Area this past weekend to attend a San Jose Sharks game with John’s brother, Thomas. The Sharks are an ice hockey team and Thomas has season tickets. Nice. All four of them had a blast. Apparently it was a nail biter near the end. And those are the best games. 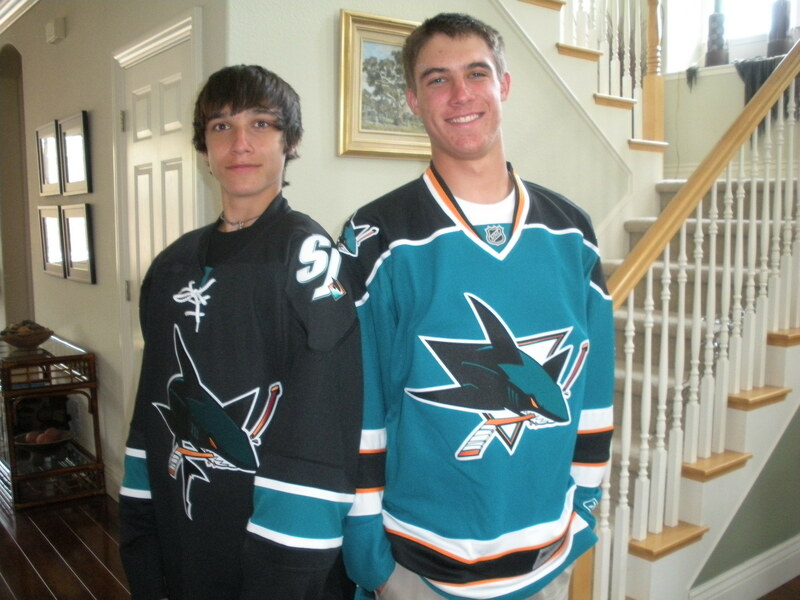 When the boys got home yesterday afternoon, they were both wearing Shark jerseys. Uncle Thomas had bought them for the boys. He wants them to come back to a future game and thought being prepared with the right fan gear was a must. After all, he was wearing his jersey. “I’d say about 60% of the people there were wearing jerseys,” said Nathan. Shoot. Those must be the die-hards. I noticed both boys had jerseys with no numbers. “How much were the ones you’re wearing?” I asked. I about fell out of my chair. Are you kidding me? One hundred thirty-five dollars for a jersey? Granted, they were really nice looking jerseys. But one hundred thirty-five dollars nice? Sheesh. How much did the numbered jerseys cost? Nathan and Ryan were giving me that yikes, that’s a ton of money look. I’m sure they knew that, had they gone to the game with just me and John, they’d have walked out of there with maybe a plastic soda cup with the Sharks logo. And that’s only if they got unlimited refills (although I’m pretty sure that’s not how it works). So it got me thinking about what people spend their money on. Nathan has top of the line golf clubs because that’s his thing. Ryan has all the best running gear because that’s his thing. And, apart from the occasional gift, both of them bought most of it themselves. Because that’s what they spend their money on…when they spend it. So an authentic Sharks jersey for $135 really isn’t that much if you’re a die-hard Sharks fan that goes to most of the games (which is an additional exorbitant expense). For those fans, going to the game to enjoy an evening watching their favorite team all decked out in teal and black jerseys – well that’s their thing, their passion. And I know the boys were thinking it’s really nice having an uncle who wants to share his passion with us. The next time they all go to watch another game, it’ll be Thomas, Nathan, and Ryan showing their team spirit…and John sitting next to them in his faded gray sweatshirt.